Denim jackets are great but fall is leather season as there is no better transitional fabric for an outer layer. Therefore, it's time to temporarily retire your denim jacket in favour of a heavier-weight leather option. Whilst you're at it, why not go for some colour. The high street is full of coloured biker jackets at the moment and I seriously want them all! Plus, they look so much more interesting than an old tired black one and colour isn't going anywhere. Yes, dramatic sleeves are sticking around for yet another season. Puffy, bell and frilly sleeves add an extra touch to any outfit making it that much more special and interesting. I've talked endlessly about the power of sleeves in previous posts, so check them out for more inspiration. We all love our skinny jeans but the great thing about jeans is all the different shapes and sizes available out there for us to try and have fun with. Granted not all will suit our body shape but for fall think embellished denim, frayed hems and wide legged styles. These will look great with a wide variety of footwear including your beloved and fall must have ankle boots. When it comes to fall footwear, we often go for the obvious and forget that we can still get away with open shoes. In this outfit, I could have chosen black ankle boots but instead, I opted for barely there sandals with metal studs for an overall rocker look. Not only can I wear these during summer months, they are also great for transitioning into fall. Similarly, the quilted bag is a classic and I cannot think of a better option to finish pretty much any outfit I will be putting together this coming season! 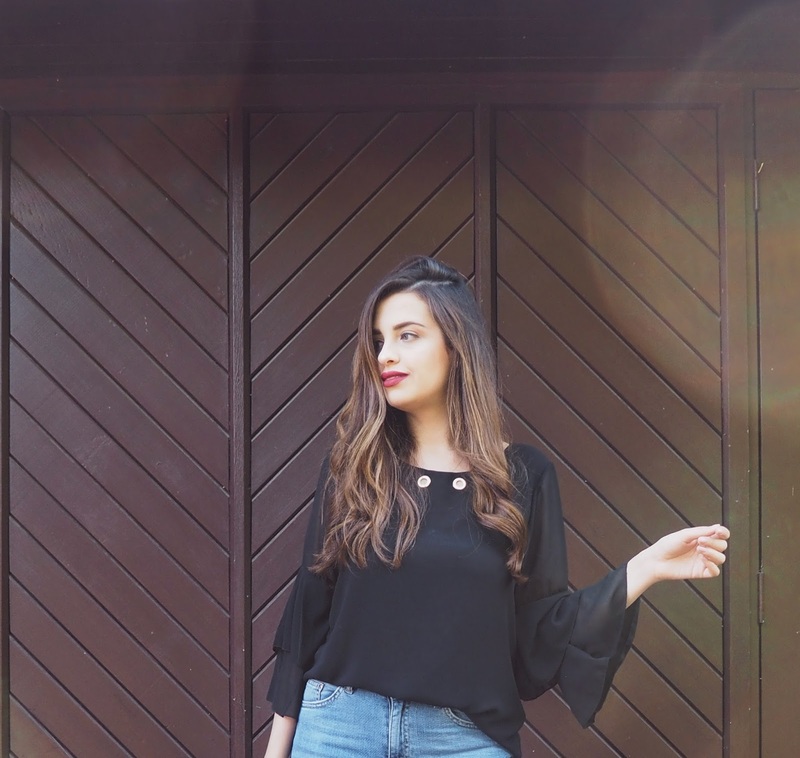 Whenever I'm stuck for new outfit ideas, I love drawing inspiration from fellow bloggers, Pinterest, magazines and even TV (I kid you not, I REALLY wanted a bow hairband inspired by none other than Blair Waldorf...but ultimately decided against it). Pinterest and alike apps are great for finding contrasting pairings and are life savers some mornings when I have no idea what to wear. Similarly, there are sooo many stylish babes on Instagram, it is impossible not get to a little inspired from them. My favourite has to be Camila Coelho, who I actually got inspired for this look as her casual looks are anything but boring and she loves her biker rocker style. This fall, if you're not too sure on how to wear those boots you just bought or that sweater, don't be afraid to do a bit of research. I'm not ashamed to say I do this all the time, it is not copying but rather just taking in some inspiration and putting my personal twist on it. What do you think of these tips? If you have any of your own let me know below! Also, check out Quiz Clothing for a wide range of Going Out Dresses and much more! Thanks for reading beauties and I will see you later in the week! Love the colour of that jacket. TV is a great source for fashion inspiration. I remember that back in high-school I used to be obsessed with Blair`s style. I've the jacket with same color and I really love the contrast! Absolutely no way to keep track with every Instagram star but yea finding yourself a few can be helpful and inspirational! Super cute outfit! And I love that jacket! I love scrolling through Pinterest for inspo! Love the outfit you've shot and I think your tips are great - I love wearing leather and I always accessorize to add something special to my outfits! I love this outfit! Autumn is bar far my favourite fashion season. I own a brown leather jacket that I can't wait to pull out again, but the gorgeous color you picked is stunning as well. Loved this post, leather is always a good idea! I love the jacket Pam! To be honest there is no signs of Autumn on my side yet, it's still hotter than hell. I love dramatic sleeves! :) No matter how plain looking an outfit is, a dramatic sleeve always step it up a notch! Lovely outfit, the jacket is a gorgeous colour! I love this outfit Pam, you look amazing! And I love those jeans. Great tips too! I totally agree with you that fall fashion is so beautiful! I mean, for me much better than summer fashion! You look great, Pam! I loved your jacket, such a beautiful colour! And the top and sandals are also lovely! Hope you have a beautiful day! Mal posso esperar pelo Outono! Adoro essa época do ano e amo as roupas de outono/inverno. 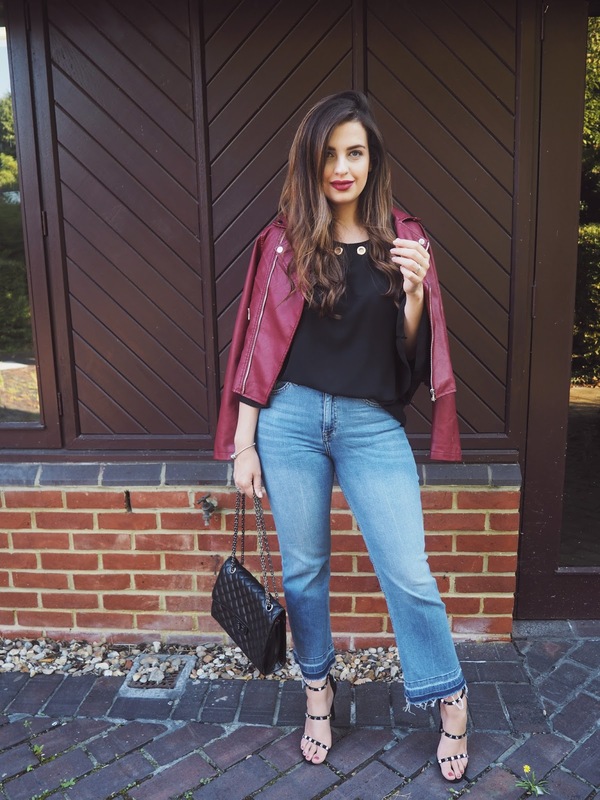 Great tips, I've never owned a leather jacket but I like the idea of a burgundy coloured one! Pam you just look incredible - as per!! I'm loving your Autumn clothing tips. I've never shopped in Quiz before but omg, I need that beautiful wine jacket in my life ASAP! Love the outfit Pam! I need that leather jacket in my life! O look completo ficou lindo, mas fiquei apaixonada na sua sandália. Absolutely loving this look, it's so chic and that jacket is incredible! That jacket is great, love the color. Adorable inspirations you got there. My fave would be the 1st outfit, I just love leather jackets, and the difference they can provide for such casual outfits like simple tees and denim pants. You look so beautiful in burgundy color! Awesome jacket and blouse, I like this outfit! The jacket is very lovely Pam. Oh my goodness, this heat is unreal. Yesterday we hit 111 degrees, today will be hotter. I am so ready for Fall and Fall fashion. You look lovely! Oh I absolutely love this outfit! That jacket is so cool and I'm in love with the color. 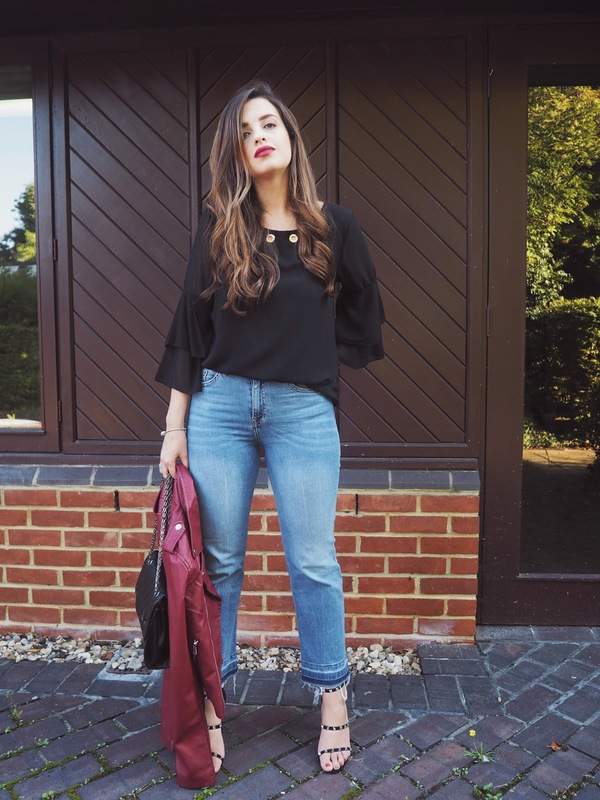 Your jeans and awesome as well, just like the top and the all the trendy details in it <3 Thank you for your tips, lovely!! Can't believe fall is here (actually just realised it today, when I got to work summer-dressed and almost froze :'). loving your look hun and great tips indeed!! This Burgundy jacket is amazing, I love the colour and it suits you so nicely! Such a great colour to wear during Fall especially teamed with a matching lip! Great photos, love the sandals and the bag too!